Martin Herrenknecht, founder and chairman of Herrenknecht, a German manufacturer of tunnel-boring machines, explains why he located the Swiss arm of his business in the Canton of Uri, which is located in the heart of Europe, and enjoys a strategic position alongside Europe's north-south rail and road transit axes. If you want to know why Herrenknecht decided to locate its Swiss base in Uri, you must go back to 1971, four years before the German company was founded. Then, a young Martin Herrenknecht had taken up his post as head of a mechanical engineering service during construction of a 9km-long highway tunnel in Uri. Along with his work on the tunnel, he got to know the canton and its people. Daily operations proved difficult and some problems, such as the transportation of oversized machine parts, could be solved only with the help of enthusiastic allies in the region. "It was an interesting experience as I learnt that one can rely on the people of Uri," says Herrenknecht. Since then, Switzerland has always had a special meaning for Herrenknecht. 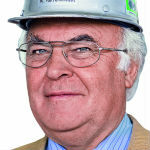 In the early 1990s, his company built technically ground-breaking rail and road tunnels in the western part of the country, which were then followed by contracts for the Gotthard and Lötschberg base tunnels, part of the AlpTransit project (also known as the New Railway Link through the Alps or NRLA). Herrenknecht has had a presence in Uri since 1995 and the inauguration of its own workshop in 1998 in Amsteg was a company milestone. Suitable industrial land at the Gotthard Base Tunnel was also found and its purchase supported by Uri's Department of Economic Affairs, the government and the cantonal administration. As Herrenknecht says: "I experienced Uri's economic development support at its best." Working from Uri has many benefits, says Herrenknecht. "With well-qualified personnel, we can guarantee that large tunnel projects in Switzerland and abroad benefit from the best service and maintenance, as well as expert advice. In Uri, products of the highest quality are produced at a consistently high level, the labour market offers high productivity, and the department of economic development supports the company at all times, and provides help and advice where necessary." "In Uri, products of the highest quality are produced at a consistently high level, the labour market offers high productivity and the department of economic development supports the company at all times." The production site in Amsteg is used for the assembly and inspection of disc cutters. These excavation tools play a vital role in mechanised tunnelling through hard rock, as their lifetime, efficiency and reliability significantly affect the cost of the excavation. In close cooperation with a global supplier and integrator of components for the mechanical engineering industry, located in Altdorf, the capital of Uri, the working lifetime of the high-quality cutting tools and disc cutters was significantly improved, and subcontracts were awarded to metal processors in Uri. The commitment of all parties is clear, and in total the factory in Amsteg has manufactured and refurbished more than 22,000 high-quality disc cutters for the Gotthard project alone. At the Lötschberg Base Tunnel, 18km tunnel sections were bored, and at the Gotthard Base Tunnel, four Herrenknecht tunnel-boring machines cut through 85km of hard rock. In November 2005, the Herrenknecht Group was restructured, and Herrenknecht was incorporated into Herrenknecht Schweiz Holding, with its headquarters in Altdorf. With the establishment of the holding company, the structure of the group in Europe was adapted to its growing market, as well as to the particular importance of Switzerland as a location. The 100% subsidiary of the parent firm holds and manages about ten Herrenknecht companies and associated businesses in Europe, including those in France, Italy, the Netherlands, Spain, Switzerland and the UK, as well as in Abu Dhabi in the Middle East. The chairman of the holding company is a true Urner, the former president of the cantonal executive and Uri's former economic director, Ambros Gisler. The decision to also locate the holding company in Switzerland was based not least on the stability and security of the country; legal certainty and transparency, particularly in tax matters, which ensure companies can make long-term plans for future investments; tax; and access to decision-makers, which is direct and reduces the administrative burden, and ensures businesses low compliance costs. The Canton of Uri also profits from the bilateral agreements with the EU, which means that there is no quota on the number of employees that can be hired from EU countries, while work permits are relatively easy to organise. "Thanks to the Gotthard Base Tunnel, Uri can be marketed internationally as an outstanding location for environmentally friendly transport infrastructures." The new Gotthard Base Tunnel, scheduled to open in 2016, has received tremendous attention both in the professional community and in the media worldwide. It is a truly pioneering feat for Switzerland and an excellent reference for the companies involved. The construction of the tunnel and the complex knowledge gained has had an impact on the planning and execution of various projects worldwide. Thanks to the Gotthard, Uri can be marketed internationally as an outstanding location for environmentally friendly transport infrastructures. And for Herrenknecht, engineers and staff can use the expertise they have gained in Uri globally. "Thanks to the experience we have gained in the construction of the Gotthard tunnel, we have been able to deliver a hard rock machine to Australia, two hard rock machines to Ecuador, and several tunnel-boring machines to China and Turkey. Eyes still light up if we mention the Gotthard project - the longest tunnel in the world," he says. Uri offers a quality of life that includes sports and leisure opportunities all year round, such as water sports on the Mediterranean lake of Lucerne, activities in the mountains and golfing in the valleys. There is hotel accommodation of every standard, too, from the traditional cosy chalet to the most exclusive all-year-round holiday destination. Local museums, open-air theatres and concerts also enrich the cultural life of Uri and attract fans from beyond the immediate region.